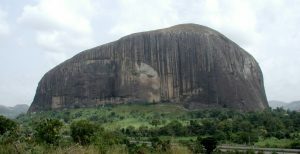 On the way he would have had a bird’s eye view of the monolithic Zuma Rock, just west of Abuja, the capital city. This is an igneous intrusion, 725m high and about 3km circumference, rising out of a green river of trees, high and bald as a hippo’s back. It looks as if it should be associated with eagles but its old name, Zumwa, means ‘the place of catching guinea fowls’. 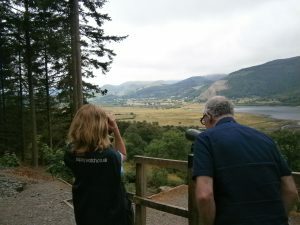 The Osprey Viewpoints with telescopes at Dodd and the CCTV at Whinlatter Visitor Centre will be open from Monday April 1st until August 31st 2019. We hope that our adult male bird will find a mate. Perhaps the female that stayed in the Valley for much of the 2018 Season will return. 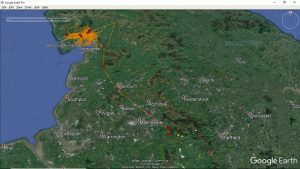 will breed in South Lakes for the first time in 2019, after the 4000 mile journey across the Sahara and Europe. 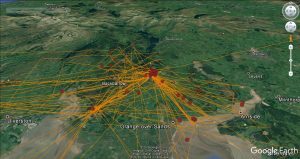 This were his movements (actually very little movement – just roosting and fishing) for the week preceding 14th Feb.
No 14 – On the move! With Pete stranded on the Isle of Arran with Ali and Phil off in blowy Cornwall our boy certainly chose his moment to start migration. 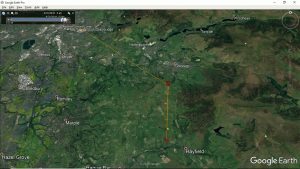 He left South Lakes at 08.00 on 20th September, travelling obliquely down the country and arriving at Hayfield in the Peak District at 20.00. He should be well down France by now. 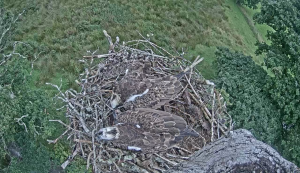 Just a short update on No 14 – no movement away from the South Lakes as yet. Umber, into the blue of evening. To slide out now above the thigh of Raise and high Hellvellyn. 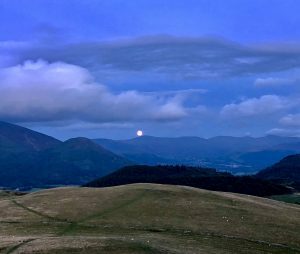 the single lunar spinnaker above the range. Following its silver pathway South; skimming the dark Lake of the skies. 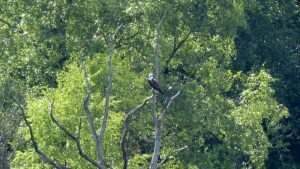 Although there have been some tremendous sightings of our ospreys from the Dodd Viewpoints this year, fishing, flying and perching in the ‘Y tree’ there have been very few sightings on the nest. This has been because Unring has been visiting it only very fleetingly. Our live CCTV view of the nest has been a bit like hosting an invisible lodger, although instead of washing up appearing and disappearing and the odd move of furniture it has been the sticks, moss and grass that have been added or their position changed. However, on Friday we had the joy of seeing Unring settle on a nearby branch with an ENORMOUS trout. He obviously thought that home would be a quiet place to enjoy a late lunch. He reckoned without taking the beady eyes of his lady friend, Longstreak, into consideration. Seeing her homing in from afar he hopped onto the nest and started mantling his prey, hiding it with his wings – perhaps she wouldn’t notice? Small chance of that! A minute later she was standing beside him and with determined subservience edged nearer and nearer, peering under his pinions to catch a glimpse of his piscatorial prey. With a palpable sigh he flicked back his wings – she was obviously going to win so it might as well be now as in 3 minutes time. She neatly hooked it with her beak, transferred it to her claws and turning her back on him, took off. Well – what are men for but to look after hungry ladies? 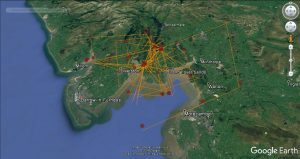 Update on No 14 – as you can see he has definitely made his home this summer in South Lakes with its wide estuaries, flowing tides and shifting sands. Hatched in 2013 he is fast growing up into a mature bird. 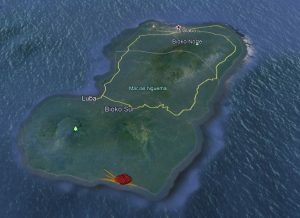 Establishing a territory and demonstrating fishing prowess is key to getting a partner so we hope he has now put himself in an ideal position to start a relationship next year. Now that it is damper and despite the earlier drought one tough plant is blooming now all along the wood edges. One of the most attractive plants of the forest its flowers stand around the stem like a wand of white stars. This is probably what has inspired its common name ‘Enchanter’s Nightshade’. Its Latin designation Circaea lutetiana follows this theme from Circe, a witch of Greek mythology and Lutitia the Latin for Paris, sometimes known in the past as the Witch City. 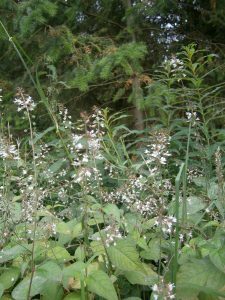 In fact the plant is not poisonous being related to the Willowherbs and no connection to the Nightshades. It needs no enchantment though to still view ospreys from Dodd. Unring continues to guard his territory and visits his nest daily. At least 2 other ospreys are regularly seen at the South end of the lake – probably Longstreak the young unringed female and Blue 2H from the North end of the Lake. 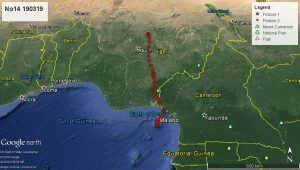 However, as mid August approaches it is getting time for the female birds to set off for Africa from all over the country so it is worth keeping a lookout on any piece of water for sightings of these birds migrating. It is still very dry with the marsh and the fell sides turning an unaccustomed pale gold where the dry grasses are bleached to savannah shades. In places, patches of glowing orange are the dead leaves of desiccated bilberry plants, their fruits falling black and shrunken before they can be picked. The stringy stalks of Bell-heather are conserving the meagre water better and producing the first swath of purple flowers prior to the August burst of common ling. In the forest silver birch trees, quick to grow, with shallower roots have been turning prematurely autumnal from yellow to brown with the whisper of their falling leaves twisting in the hot winds. Even the conifers, with their drought resistant needles are shedding pale storms of pins and their lower branches are drooping to the ground, blocking the deer and badger runs. The trackway verges through the forest are powdered white where the infrequent forestry vehicles have been writing ‘Eat my dust’ – instead of the usual, ‘Mind my mud’. 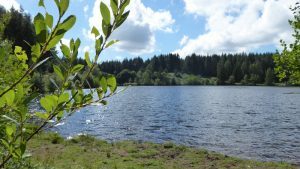 However, all may change in the next week as the forecast tells of thunderstorms and rain to come, cooling the earth and washing the warmer waters out of the Lakes. If you want to go bathing in Bassenthwaite blue water without shivers this may be the last weekend to do it! No real surprises here as no 14 leads a busy social and dining life on the S Lakes Estuaries.